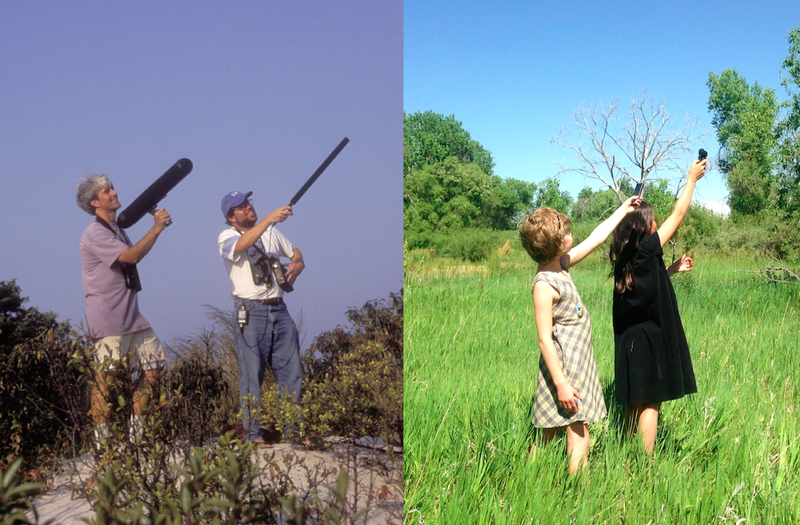 Two years ago in this space I wrote a three-part primer on the use of digital audio recorders for birding. A lot has changed since that time. The hardware I reviewed in Part 1 no longer is available. The software I discussed in Part 2 has been upgraded—plus, I’ve gotten better at using it. As to Part 3, the philosophical part, the key issues are still there, but I think they’re more acute now than they were in 2012. Any way you slice it, two years is a long time in the Digital Era. It’s time for an overhaul. One other thing. Of late I’ve been fielding a lot of questions about making, analyzing, and archiving recordings of bird vocalizations. In the past few months, a number of my birding friends have acquired what we lovingly refer to as “cheap pocket recorders.” More than ever, folks are appreciating birdsong. Something’s “in the air” right now, and that’s exciting. The first thing to note, I hope you’ll agree, is that the sound quality is great. Which brings me right away to a new perspective. I stated in 2012 that pocket audio recorders should be used chiefly for documentation purposes, not really for enjoying the beauty of birdsong. I hereby retract that statement. We’ll come back to this matter in a while. Now let’s not throw the baby out with the bathwater: Pocket audio recorders are still good—more than good, they’re great—for documenting rarities. Not great, not even all that good, but perfectly adequate for documentation purposes. How did I do it? How did I go from hearing the bird, to operating the hardware, to downloading the recording, to editing the sound file, to uploading it to the internet? I’ll get there. I’ll get to each step in the process from hearing the bird in the field to getting the recording online. But first things first. First we need equipment. 1. Which gizmo? Two years ago, I enthusiastically recommended the Olympus VN-8100PC. I still regard it as the best $50 investment in my life. But the product is no longer available. That, and I have a confession: Along the way, I upgraded to the Olympus LS-10. It’s bigger, heavier, and costlier than the VN-8100PC; those are negative attributes. The LS-10 also has better microphones and the all-important Olympus “zoom” option, about which I’ll say more in a bit. Unfortunately, the LS-10, like the VN-8100PC, is no longer available through Olympus. Do not—I repeat, do not—buy a logical-seeming upgrade, like the Olympus LS-10S. See if you can find an LS-10 or VN-8100PC through a reliable online source other than Olympus. Or, if you’re wary—as I am—of buying used electronic products online, go for the Olympus WS-823. I haven’t yet tested it out, but several of my birding friends are using it, and the preliminary reports are favorable. It seems a better option overall than the Olympus WS-822, another produce I’ve heard birders are using. The ideal digital recorder has the following: high-sensitivity microphones, a “zoom” option that combines the two microphones into a single shotgun-style setup, “low-cut” filters for dampening low-frequency “noise,” wind baffles, a decent carrying case, and a short USB cable. Good customer support and an intelligible user’s manual would be nice, but Olympus hasn’t gotten there yet. Olympus isn’t the only show in town. One of my birding friends uses the Sony ICD-TX50, less expensive and substantially smaller than the Olympus LS-10. The Sony ICD-TX50 is quite a bit smaller, in fact, than the discontinued Olympus VN-8100PC. In direct comparison with the LS-10, the Sony ICD-TX50 is a bit less sensitive and a bit “noisier”—in the same league, I would say, as the old VN-8100PC. If you want a no-frills-but-perfectly-serviceable entry-level digital recorder, the Sony ICD-TX50 may well be your best bet. The Zoom H4N portable digital recorder seems promising, although I base that assessment solely on specs and reviews online. Given the company’s name, you might expect that the Zoom H4N would feature a “zoom” option, à la the Olympus LS-10—but I can’t quite tell from the reviews and specs online. One reviewer mentions a “zoom”-like setting, but I’m not seeing it in the specs online. There are alternatives to the “cheap pocket recorders” offered by Olympus, Sony, Zoom, and others. You can use your smartphone—either as a recording device unto itself or in connection with an external microphone. Not having an additional piece of equipment—that is to say, not buying a separate, standalone product from Olympus or Sony or Zoom—certainly is appealing. But a smartphone by itself isn’t as good. So download an app like Audio Memos that gives you more options. As to the external microphone, you can go fancy or simple. In a two-part online review of external microphones (Mic up that iPhone and Mic up that iPhone: Follow up), Bill Schmoker makes the case for simplicity. And Diana Doyle, in her trademark readable and informative style, offers additional tips in an online tutorial, Pocket Bird Recording: In the Field. Going in the opposite direction, you can spend thousands of dollars on recorders that look and feel like cinder blocks. And if you have any cash left over, you can splurge on microphones that either look and feel like a rocket launcher (these are the shotgun microphones) or the Arecibo Observatory (these are the parabolic microphones). They perform a bit better than the Olympus LS-10. They’re not for me. Then again, I once swore that I’d never upgrade beyond the VN-8100PC. 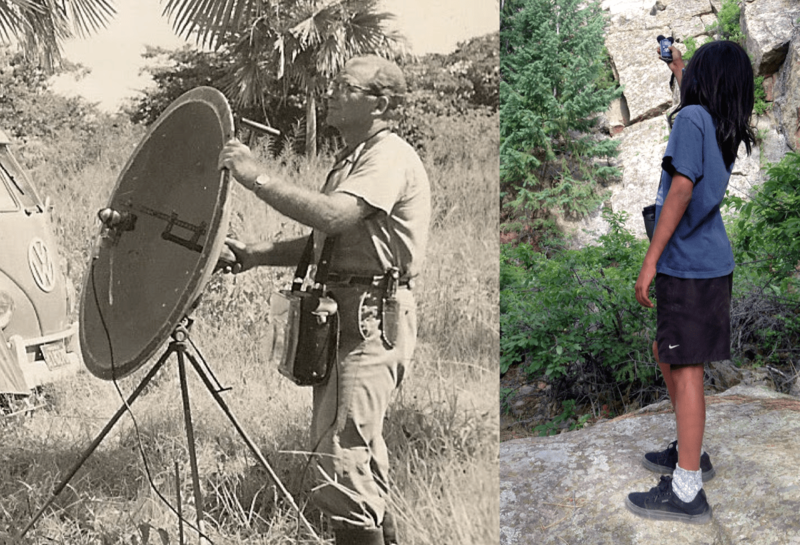 Left: Pioneering tropical ornithologist Paul A. Schwartz records birdsong, ca. 1960; photo by © Ramón Rivero. Right: Topiltzin Martínez records birdsong with a newer instrument, June 2014; photo by © Ted Floyd. A final matter, before we move on. Please, if you’re using a different product from the ones I’ve tested, let us know what you’ve found. Or if you’re using one of “my” recorders and disagree with my assessments, tell us about that. I’m not a tech guy, and I may well have some of my facts wrong. I’d love nothing more than to learn cool stuff about making, enjoying, and understanding digital recordings of birdsong. 3. Operating the hardware. Hey! Wait a minute! What happened to step #2? I’m going to postpone that till the end. It’s a biggie. It challenges us with some subtle philosophy and psychology. We’ll come back to it. For now, let’s talk about operating the hardware. Note: Unless I say otherwise, all my remarks from this point forward are about the Olympus LS-10. I wish I could say with a straight face that using the LS-10 is as easy as whipping out the recorder, turning it on, and pressing RECORD. It really is that easy with the VN-8100PC. With the LS-10, however, you have to unzip the case, take out the recorder, turn it on, give it a second or two to boot up, press RECORD, adjust the record level (or decline to do so), then press RECORD again, then point it at the singing bird. That process takes about 5–10 seconds, in contrast to 3–5 seconds for the VN-8100PC. If you’re on a fleeting rarity, seconds can make a difference. WIND BAFFLES: Make sure they’re affixed. AA BATTERIES: Make sure they’re installed. INTERNAL MEMORY: Make sure you have some. I find that the preceding settings work well for practically all field situations. With loud birds in otherwise very quiet environments, I might turn the record level down to around 5. With faint, faraway, rare birds I might crank it up to 10. Basically, somewhere in the 7–9 range is fine in most applications. Left: Bill Evans and Michael O’Brien record flight calls, August 1998; photo by © Volker Dierschke. Right: Reese Burke and Hannah Floyd record flight calls, June 2014; photo by © Ted Floyd. Alright, now you’re ready to whip out the recorder, turn it on, and press RECORD—remember, you have to do it twice. Oh, and don’t forget: Be sure to hit STOP when you’re done recording. Several times, I’ve forgotten to do that. Right before I press STOP, I make it a point to speak softly into the recorder (real soft, as these microphones are quite sensitive, especially with the settings above) where I am and what bird species I just recorded. I don’t trust my memory. The recorder automatically stamps the date and time for you. 4. Download the recording. The LS-10 has 2 gigabytes of internal memory, an amount that can be gobbled up during the course of a weekend’s worth of fieldwork. So you should buy a memory card with an extra 8, 10, or more gigs of memory, yes? Actually, I recommend against that strategy. It’s a matter of personal discipline. I find it essential to regularly download, rename, and organize my files. If I don’t do that every 30 or 40 recordings or so, the files become as disorganized as the proverbial shoebox full of notecards in your mom’s attic. To download the files, turn on your computer and connect the recorder to the computer via a USB cable. Doing so will automatically activate the recorder. Grab all the files from the recorder, and drag them over to the computer. A bizarre feature of the VN-8100PC, the LS-10, the LS-10S, and probably other Olympus products is that the files aren’t really deleted—at least, not on my Mac (a friend says this isn’t a problem on a PC). Anyhow, you can’t see the files or access them, but they’re there, taking up space. So double-click the ERASE button on the recorder, then answer ALL ERASE at the prompt; the gizmo will confirm with ERASE DONE. Perform this operation from the recorder itself, disconnected from your computer—after you’ve properly removed the hardware. Thus, I recorded a Long-billed Thrasher [LBTh] at Choke Canyon State Park [CCSP], Live Oak [LiOa] County, Texas, at 8:49 a.m. on April 23, 2014, and again at 8:51 a.m. Two days later I recorded another Long-billed Thrasher, also at Choke Canyon State Park, but this time over in the McMullen [McMu] County portion of the park. I recorded a Northern Mockingbird [NoMo] in Reno, Washoe [Wash] County, Nevada, at 12:10 p.m. on December 8, 2013, and I recorded Pearly-eyed Thrashers [PETh] at the dates and times shown on Guana Island, off Tortola, British Virgin Islands. Note that I record in .wav (waveform audio file) format, generally the highest-quality files you can make with “cheap pocket recorders.” They are the audio equivalent of “raw” or “uncompressed” photos. They’re big. Just those seven files above (three Long-billed Thrashers, one Northern Mockingbird, three Pearly-eyed Thrashers) take up 54.6 megabytes. Amass a thousand such files (which you’ll easily do after a year or so of making recordings), and you’re getting up toward 10 gigabytes. So storage is a consideration. I keep my files on the cloud. Alright, we’ve acquired a recorder (step #1), heard the bird in the field (step #2, but, remember, we’ve skipped that for now), recorded the bird (step #3), and downloaded the recording (step #4). Now for the fun part.